Augmentative and alternative communication (AAC) is a form of communication used instead of or along with talking. AAC helps children who have difficulties hearing and/or speaking. These alternative forms of communication can help children take in and understand messages, as well as express their thoughts and ideas with others. There are unaided and aided forms of AAC. Unaided forms of AAC require children to use their bodies to communicate. They can use sign language, gestures and facial expressions. An example of this is a hand gesture like the ‘thumbs up’ sign. Aided forms of AAC require a child to use equipment and devices to communicate. This could include a pen and paper, pictures, or a device that requires batteries or electricity. 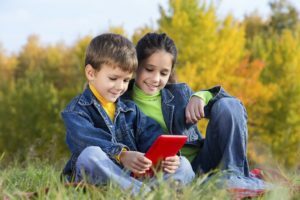 What do AAC devices offer to a child? Can I purchase my own AAC mobile apps and devices for my child? Mobile technology has made AAC software easier to access for families, however, children should always receive a formal evaluation for AAC by a speech and language pathologist who can choose a program that best suits the needs of the child. Your healthcare provider can offer you a referral for a speech and language pathologist. Many pediatric therapy clinics also give free screenings to children.